Careful readers of all of our Tower Site of the Week visits to southern California all these years may have noticed a pattern: almost all of our tours of Los Angeles-area sites take place in April. That’s not just because April is usually a congenial time to visit the Southland – after all, almost any time of year finds pleasant weather there – it’s also a question of logistics. Being based on the other end of the country, it’s obviously much easier to work a Los Angeles visit in when we’re already heading west for something else, and of course every April for more than a decade has found us heading west to the NAB Show in Las Vegas. Over the years, then, we’ve had ample opportunity become enamored as well of the drive from Vegas down to Los Angeles. There’s not much radio to check out on the first half of the drive – just a lot of desert vastness off both sides of the I-15 freeway, interrupted at Baker by a stop for a fresh strawberry shake at the Mad Greek. But the second half of the drive? That’s full of radio, as the desert gives way first to the small town of Barstow and then to the exurban sprawl of the Victor Valley…and then as the freeway heads over the pass into the “Inland Empire” cities of San Bernardino and down toward Riverside. As it happened, our April 2010 trip allowed for some big chunks of time to drive around and see some of the sites in all of those areas. 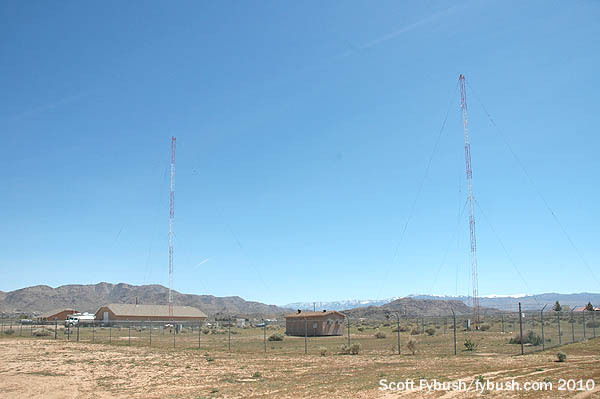 Like any other community its size, Barstow has sprouted plenty of FM signals in the last few decades – there’s the “Highway Radio” group, based out of studios in the Barstow Station tourist stop along I-15, as well as KIQQ’s sister station, KIQQ-FM (103.7 Newberry Springs), and two Dos Costas sister stations to KSZL, rhythmic KDUC (94.3) and regional Mexican KXXZ (95.9), and Radio Lazer’s KBTW (104.5 Lenwood). 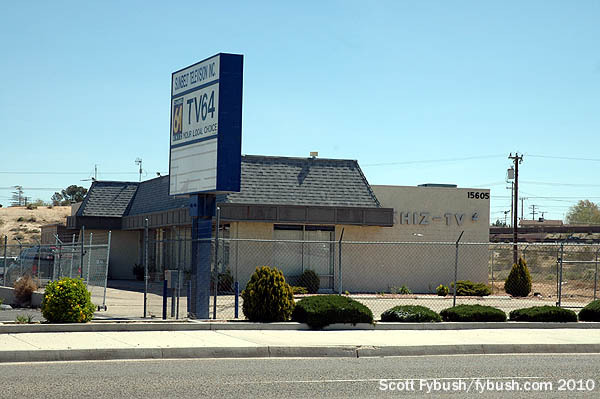 Instead of trying to get up to the inhospitable hilltop sites for the Barstow FMs, we headed south on the 15 for another half-hour to Victorville, the desert community that attracted plenty of long-distance commuters seeking lower housing prices in the 1990s. 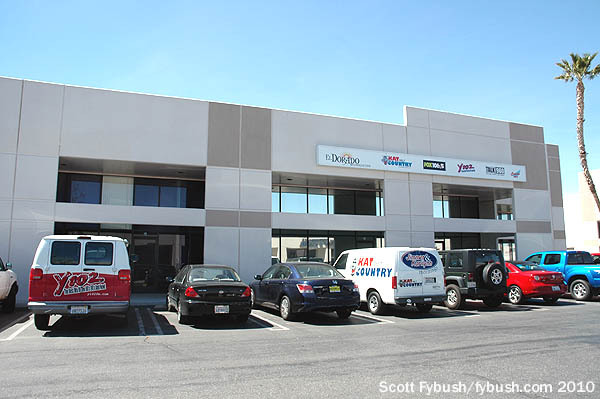 That led to a boom that lined the 15 corridor with shopping centers, filled the dial with local signals and even attracted some big players in the radio industry to expand their clusters out to the Victor Valley. 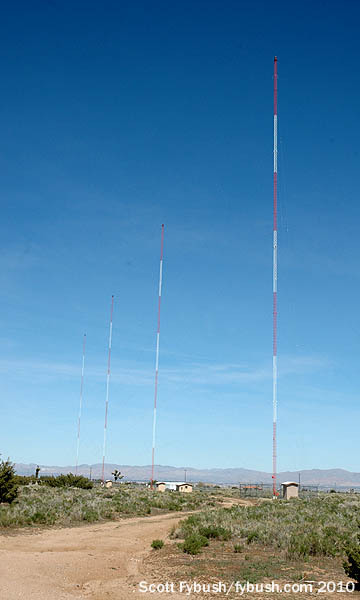 Clear Channel ended up with a cluster out here that included two AMs (KIXW 960 Apple Valley and KRSX 1590 Victorville) and four FMs (“Kat Country” KATJ 100.7 George, “AC “Y102” KZXY 102.3 Apple Valley, rocker KIXA-FM 106.5 Lucerne Valley and oldies KRSX-FM 105.3 Yermo/Barstow) before selling most of those stations to El Dorado Broadcasting, which operates most of those stations today from the old Clear Channel studios in an office complex south of Victorville and east of the 15 on Hesperia Road. 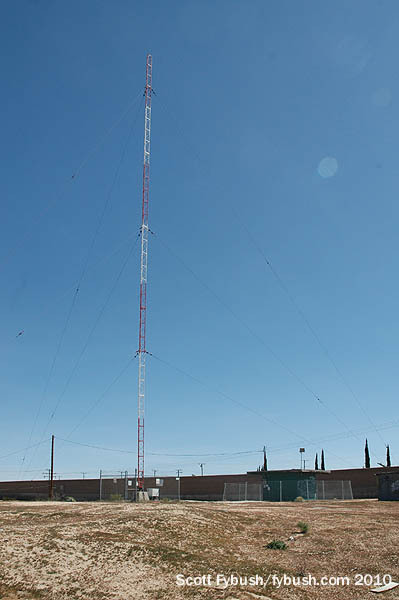 Moving down the dial, KWRN (1550) out in rural Apple Valley, east of Victorville, is a two-tower directional regional Mexican station running 5000 watts by day, 500 watts at night. It’s another newcomer, having signed on in 1991. From Apple Valley, we slide southwest into Hesperia, at the southern end of the Victor Valley, where we find our last stop in the market. KRAK (910 Hesperia) has the most elaborate directional array in the valley, all for the sake of 700 watts by day, 500 watts at night. 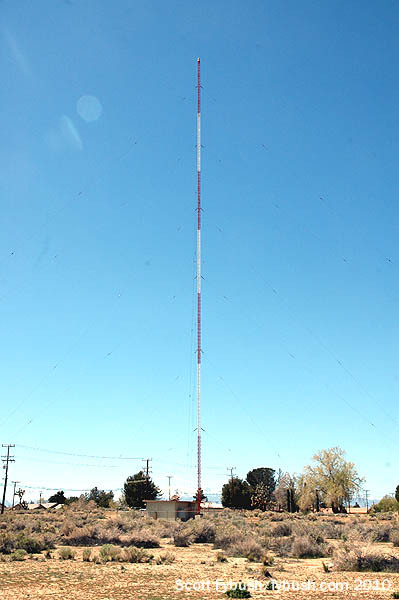 This station signed on in 1990 as KVVQ, and took the KRAK calls in 2001 when CBS needed a place to park them after many, many years in Sacramento. And we wrap up the California segment of this week’s feature on the other side of the San Bernardino Mountains, over the pass from Victorville and Hesperia. 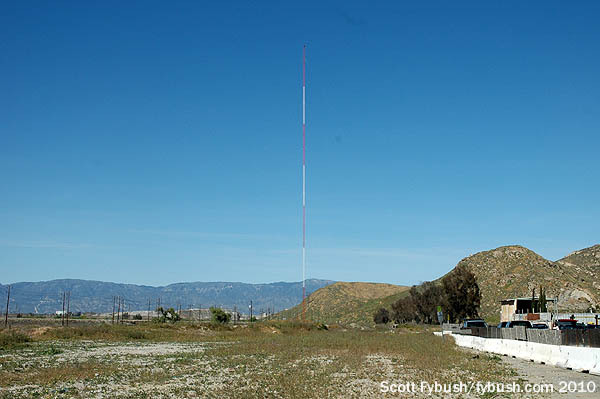 On earlier trips some years back, we’d spent some time seeing the AM sites in and around San Bernardino, and one of these days we’ll either post those old pictures or go back for newer ones. This time around, we wanted to check out some AMs we’d never seen in Riverside, south of San Bernardino. 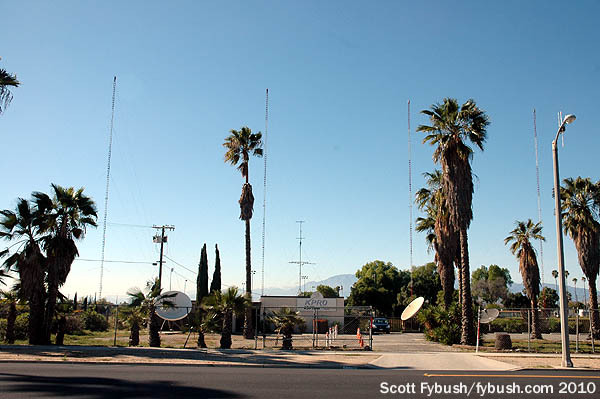 Riverside gets its name from its proximity to the Santa Ana River, and it’s near the east bank of that river just north of downtown Riverside that we find the fulltime non-directional 1000-watt signal on 1440 that was long known as KDIF. It was doing Spanish religion when we visited, but it flipped later in 2010 to full-time comedy as “Funny 1440,” KFNY. Before KDIF was KDIF, it was KPRO – and those calls eventually ended up on Riverside’s other AM at 1570 on the dial, the religious station formerly known as KHNY and KMAY. 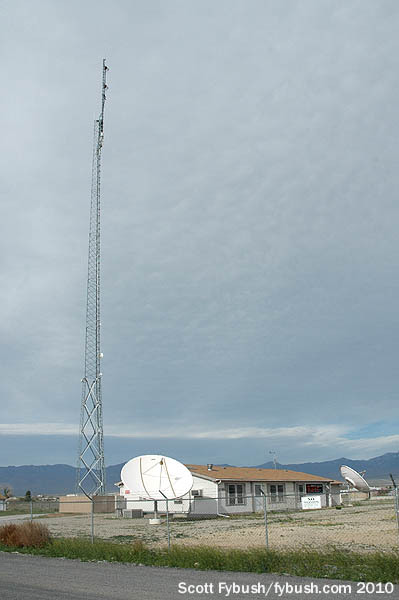 KPRO’s studio and four-tower array is on Lincoln Avenue south of downtown Riverside, where it runs 5000 watts by day and 190 watts at night. Our last stop in the Inland Empire finds us in Corona, southeast of Riverside at the spot where I-15 meets State Route 91, the freeway that goes from Riverside over the hills into Orange County. 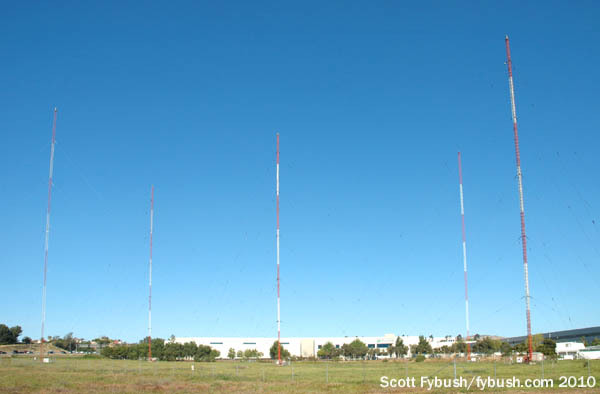 At the southeastern corner of that interchange is the five-tower array of KWRM (1370 Corona), running 5000 watts from all five towers by day, 2500 watts from three of the towers at night. 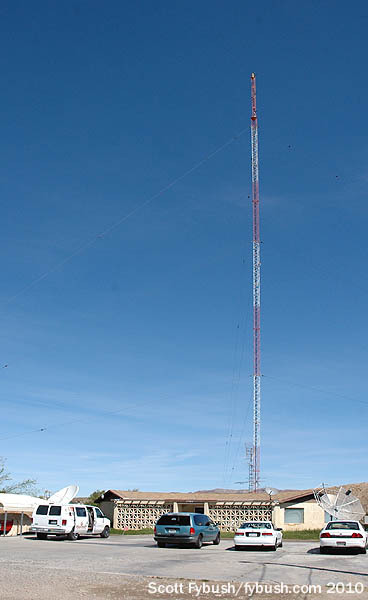 One of the day-only towers collapsed in a storm in January 2011, and KWRM has been operating with 1250 watts non-directional under STA ever since. We close out this installment with one last picture from that April 2010 trip: before pulling into Las Vegas for the NAB Show, our last stop after a decidedly non-radio weekend in Death Valley was in the small town of Pahrump, 60 miles west of Las Vegas on the other side of the mountains. 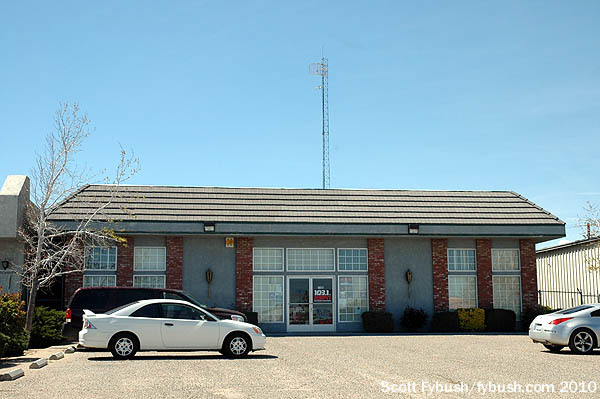 Bell built a radio station out here in 2002, and KNYE (95.1) has been serving the “Kingdom of Nye” with oldies music ever since. 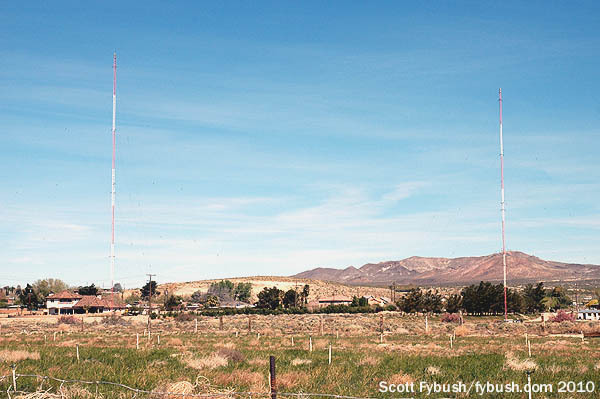 (For a while, it even reached into Las Vegas on a translator at 100.1 on the dial that now relays a different Pahrump-area signal, KHWG-FM 100.1 Crystal.) Bell sold KNYE to station manager Karen Jackson in 2008, but the station continues to carry “Coast to Coast AM” every night from 10 PM until 6 AM. 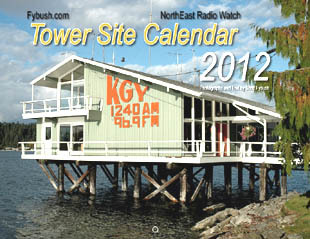 Don’t miss your chance to order the all-new Tower Site Calendar 2012, available now from the all new Fybush.com store! Scott is that mechanical beam tilt on KNYE’s antenna pole or just an optical illusion? Scoot, how do you access the tower site index? It’s available to subscribers under the “Members > Member Archives” tab at the top of the page.